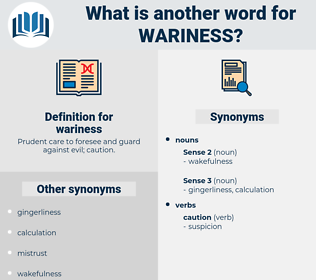 What is another word for wariness? Prudent care to foresee and guard against evil; caution. mistrust, distrust, circumspection, vigilance, suspicion, precaution, alert. ignorance, thoughtlessness, neglect, inattention, disregard, carelessness, negligence. heedlessness, inconsideration, suddenness, inconsiderateness, abruptness, remissness, brashness, indifference, unwariness, impetuousness, slight, precipitousness, incautiousness, incaution, oversight, omission. She had asked the question almost carelessly, without any thought that this might be something he wished to conceal, but she recognized her mistake by the wariness that filmed his eyes instantly. And thus many of our fears arise from old inheritance, and represent nothing rational or real at all, but only an old and savage need of vigilance and wariness.